Discover the powerful combination of storytelling with simple massage techniques with our Story Massage Training – Portlaoise, Eire. The accredited day course is suitable for everyone interested in positive touch activities for children and adults. Course Fee: €170 (includes handouts, certificate and light refreshments). “What an amazing training day! It is very rare to find an activity, which can engage all learners no matter what their needs, age or disabilities. 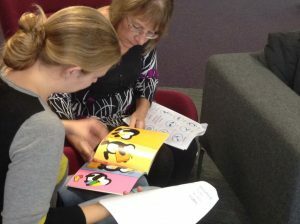 Mary and Sandra are very experienced and knowledgeable and have produced a clear and easy to follow programme. It offers flexibility to develop your own stories and make it unique to your setting.” Lisa Lawrence, Sensory Co-ordinator, Ysgol Y Deri Special School, Penarth. Facilitators: Mary Atkinson and Sandra Hooper are experienced massage therapists with a wealth of experience in using positive touch activities in the home, school and wider community. 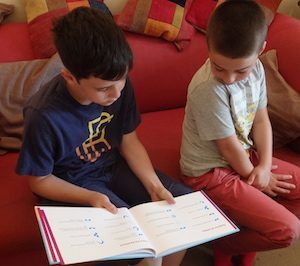 They are co-authors of the popular Story Massage book and DVD Once Upon a Touch…Story Massage for Children. Course content: Ten simple massage strokes form the basis of our Story Massage training and book. You will learn these strokes and then we will work together to adapt familiar stories or even create some massage stories of your own to use in the home, school, or as part of your work. This will help build your confidence with using story massage in the way that most suits you. During the day there will be opportunities to ask questions and share ideas with others. It is fun and interactive, just like Story Massage. Practicalities: You do not need to bring anything except a pen and paper. Where can you use Story Massage? “Enthusiastic and passionate trainers who bring their varying experiences to the course. Wonderful, hands-on, interactive training that will add a new dimension to my baby massage courses.” Natalie Leunder, Baby Massage and Baby Yoga instructor. “Fantastic. Highly recommended. A training day that can really be used on a day to day basis and adapted appropriately for each child.” Anne Steven, Rachel House Children’s Hospice, Glasgow. ” I went on the Story Massage course in Brighton in December. 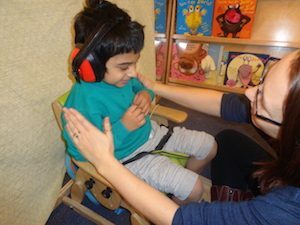 This term I have incorporated Story Massage into my daily literacy session for young children with autism and complex needs. The impact on concentration and engagement has been incredible since day 1. 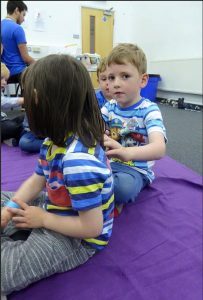 One young man has always really struggled with story time before but has been asking for ‘more’ since I introduced Story Massage! Thank you so much for this gift. I highly recommend it for anyone!” Cesci Arocas White, Teacher at a Special School.